If you and your spouse are divorcing, you may wonder what you need to do with your will. What happens to a will when a husband and wife divorce depends on the laws of your state and the type of will you used. Sometimes the will is automatically void; other times, the parties must take action to revoke the document. With a joint will, two people bequeath all of their assets and property to one another. This type of will also contains provisions concerning the distribution of assets and property when the second person dies. Essentially, the joint will is a contract between two people. Some people like the simplicity of using a joint will to plan their estate. It can also be good if you want to stop the survivor of the will from changing the wishes of the deceased spouse regarding the distribution of the estate. For example, if a married couple agrees to leave their assets to their children, but one party worries the survivor may write a new will leaving property to someone else, the joint will stops this possibility. In some states, a divorce automatically revokes a will, or makes it void. In other states, it only revokes those provisions that were gifts to your spouse. In other words, the rest of the will stays effective. At times, the will can be affected by a divorce agreement or divorce judgment even when it does not contain provisions relating to your ex. After obtaining a divorce, some people decide to make a completely new will. However, that is not the only option. Some people are fine with the majority of their will, but just want to change the provisions relating to their former spouse. Making changes to these provisions only typically creates what is known as a codicil. Any provisions in the codicil that are inconsistent with the original document will revoke the earlier will. If you are not interested in creating a new will or modifying the document with a codicil, you may be able to physically revoke the will. 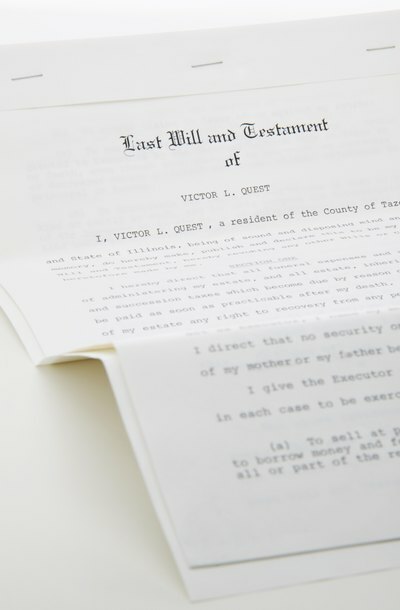 What counts as physically revoking a will varies from state to state. For example, some states would not consider a will revoked when a person writes in the margins of the document, "I hereby revoke this will." Instead, the person must write this revocation language over the words of the will or physically destroy the will by burning it, tearing it up or crossing out its words. Some states also allow a partial revocation, like crossing out only unwanted provisions. Estate Planners: What is a Joint Will? Free Advice: What Is the Effect of a Divorce on a Will?